Between two high banks, right on the sea-shore, the Coombe Barton is excellent, if one can ovelook the ridiculously overheated bedrooms. The food was good and fresh and the staff friendly. 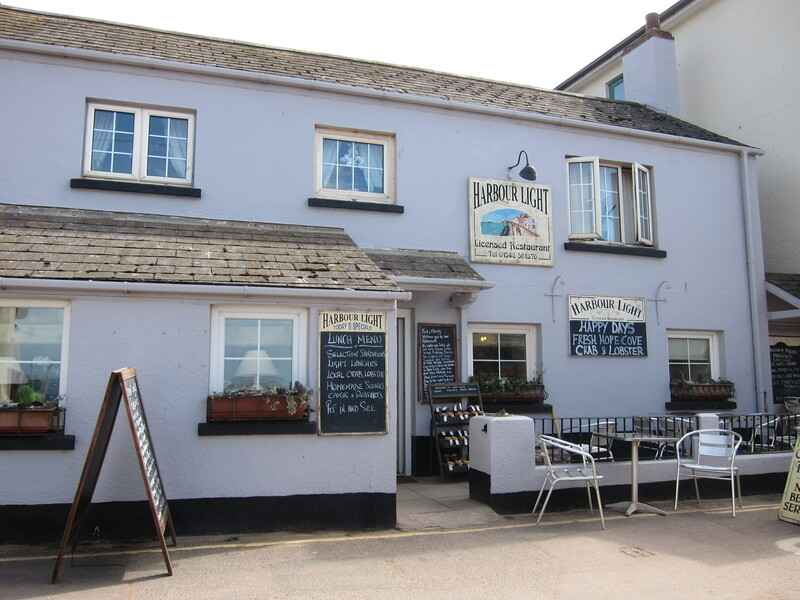 Kudos for the pint of plumptious prawns and the Cornish gin! 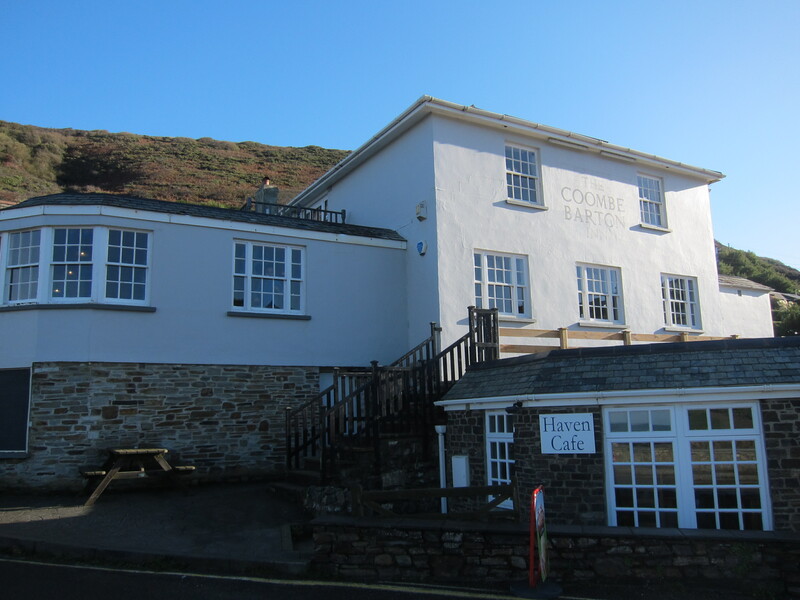 The Net Lofts is situated on the main road, coming into Mevagissey from St Austell. It’s a modern building, designed to look like – yes, you’ve guessed it – a series of net lofts. The B & B, run by a lady called Mary, was superb. We had a twin room on the third floor – it was achingly clean, with a fantastic bathroom (shared). Clever use of space gave it a spacious feel, although it was tiny. Breakfast was billed as continental, but it was far more than that – the fridge in the room had fruit, yoghurt, juice and cheeses. Very nice B & B run by Di and John Campion. Couldn’t be more welcoming and friendly, without being OTT. Had a very nice cup of tea by the family fire, whilst watching “Pointless”, and John has very kindly offered to save me and Tom the walk back to Donna Nook in the morning, by running us down in his car. We stayed two nights in the New England hotel in Boston: good, traditional hotel, run by a delightful lady whose whole face was a smile. Breakfast was excellent – grilled, not fried and the tea was plentiful. The pub was a welcome sight. It is clearly popular as we could only get a table at 5.30, by promising to leave by 7.30. There was a wide array of specials, and in the end we both went for fish pie. It was accompanied by chips, and perhaps veg would have been better, considering all the potato in the pie, but it was delicious. We shared an apple crumble and a strawberry pavlova for pudding, both of which were excellent. 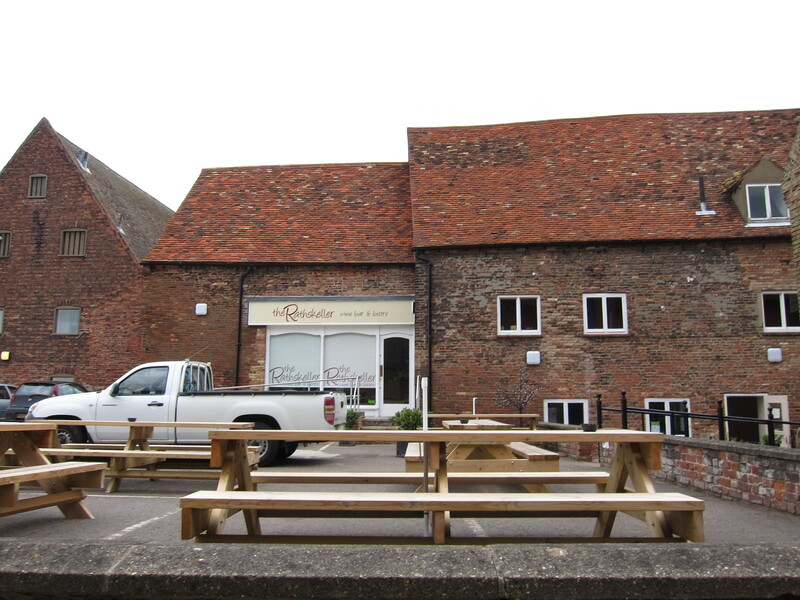 This is situated close to the Great Ouse, in Hanse House, part of the mediaeval warehouses of the Hanseatic League. http://www.hansehouse.co.uk The League was a trading association across northern Europe, active in 15th – 17th centuries. I ate from the fixed menu, a good deal for early meals. The first course was belly pork with a very interesting apple and violet flower jelly. It was followed by 3-hour chicken with some lovely fresh vegetables, although I think 2 and a half hours would have been enough. Pudding was a dream – parsnip, ginger and pear sponge pudding with brown bread ice-cream. A small guest house, a bit at sixes and sevens after the kitchen was flooded last year, but with very friendly owners, who provided an excellent bacon roll, in home-made bread. It gets a high rating because the bed was made with a sheet as well as a duvet. I hate just having a duvet – it is far too hot. I stopped at the Waterfront café in Kessingland – I had not been anticipating much in the way of an eating establishment, as Kessingland is not so much aimed at the tourist market as Southwold and Aldeborough, but I was very pleasantly surprised by a piece of lemon tart and a coffee as good as I any I have ever had. I ate at the Regatta in Aldeburgh. I had an excellent chicken, pork and prune pate, followed by a platter of home smoked fish salmon, gravadax, prawns and rost (cooked smoked salmon.). I have not had smoked prawns before but they were very flavoursome. Pud was home-made ice cream with hot chocolate sauce and espresso. Yum! All for a reasonable price too. 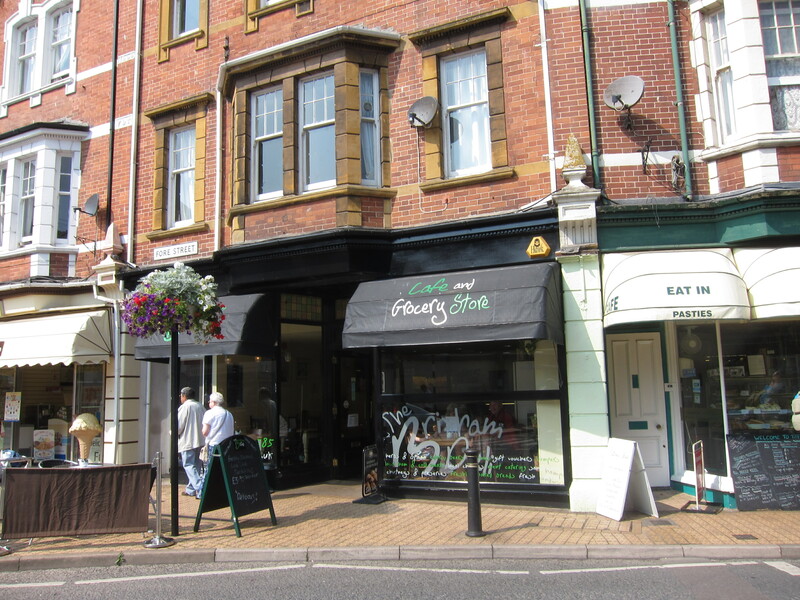 I had a super piece of home-made coffee cake in a very nice little cafe on the High Street, called Deli-cious. Highly recommend – they have lots of home-made items and gluten free cakes too. 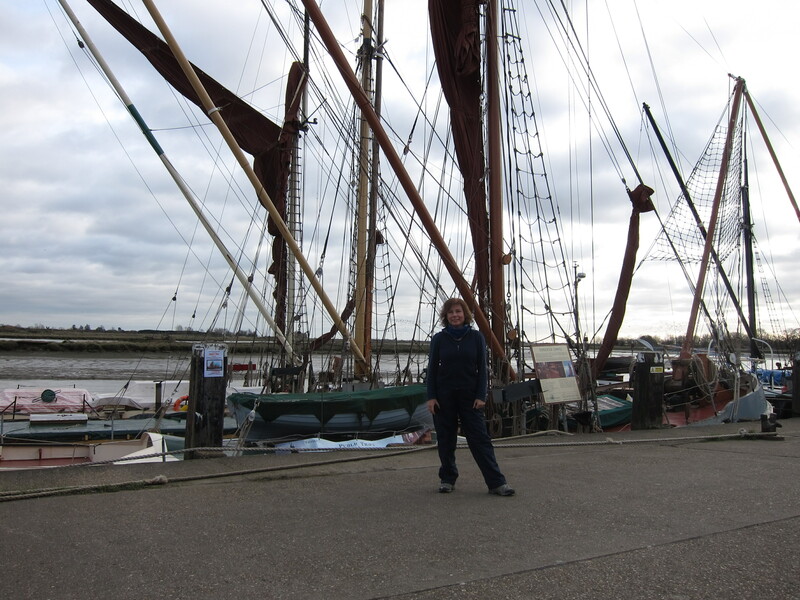 At The Hythe in Maldon, there are a number of working barges, one of which has been turned into a café used for pleasure cruises. I had a squidgy slab of homemade lemon drizzle cake, and Chris had a floury bap big enough to hold half a side of bacon, both washed down with a good cafetiere of coffee: an excellent start to the day. 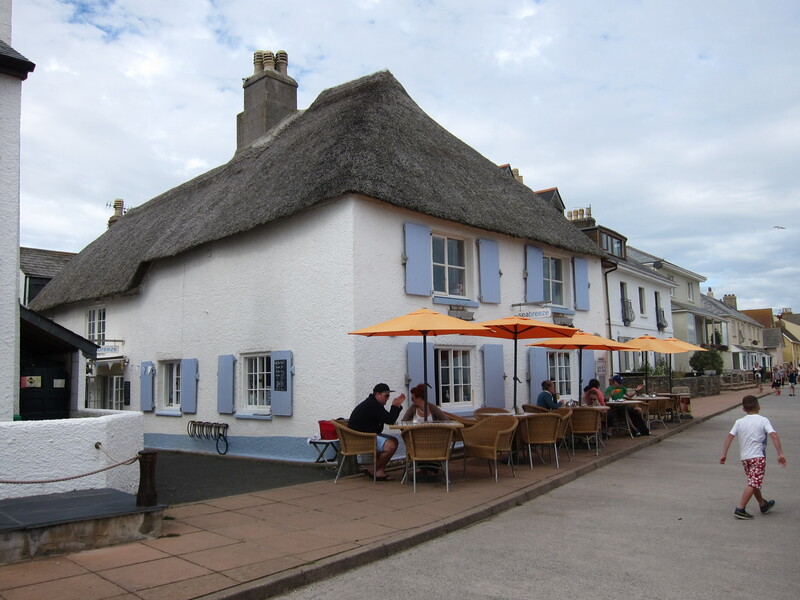 This tiny village boasts an excellent Bistro. The seafood platter was absolutely fantastic – heaped with prawns, crevettes, crab, smoked salmon etc. I have never seen such a quantity of shell fish for such a reasonable price. The fresh sea bass was also superb – light and melting. I am trying to wean myself back off cream teas and pie and chips to more healthy options! The Harbour Light restaurant served the best scones I have tasted so far, with gorgeous home-made strawberry jam, and clotted cream. 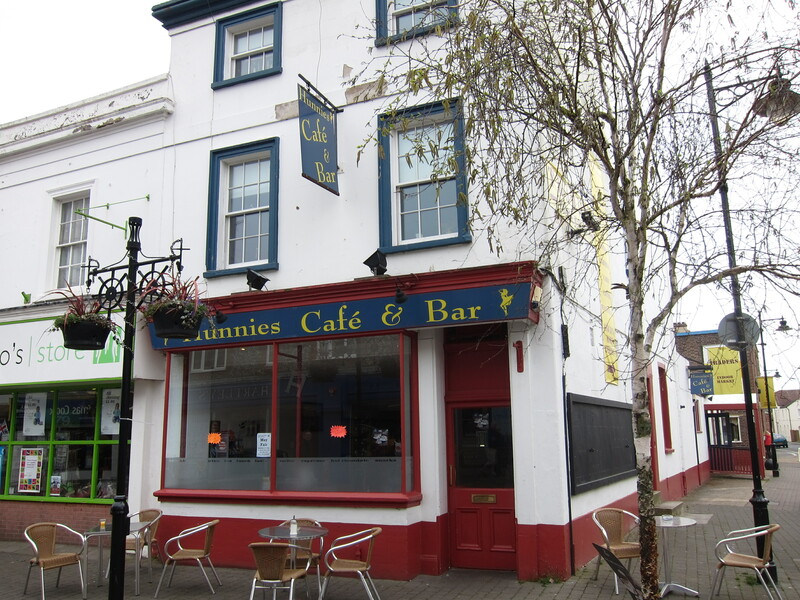 Relatively cheap too, so not sure why it was empty, other than me when the pub next door was doing a roaring trade. A really excellent tea-shop at the end of the long spit – superbly moist orange drizzle cake. 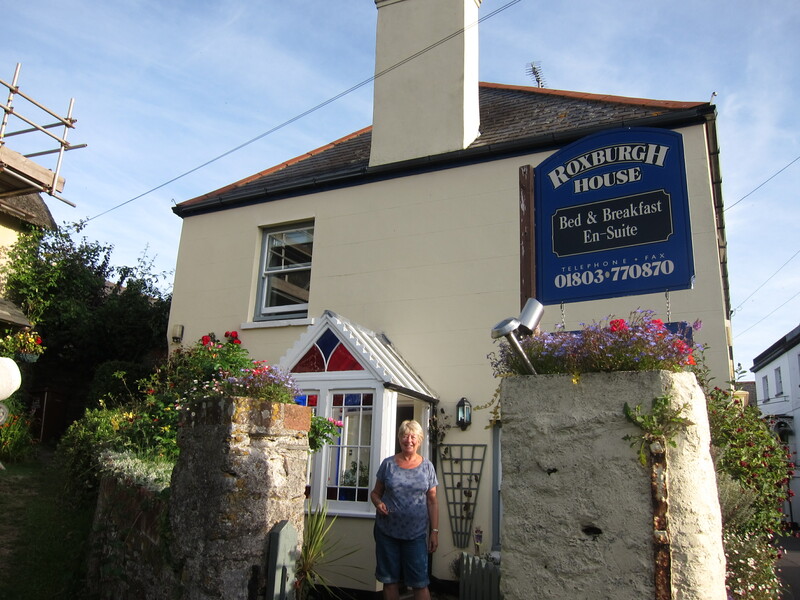 I stayed in a very nice, hospitable B & B in Strete, called Roxburgh House. I don’t know whether I was more delighted by the bath tub, to soak my feet, or the availability of fresh fruit for breakfast for the first time. There were literally dozens of cafes and restaurants, but I chose a quieter one off the main harbour front. The Brixham Deli was an excellent choice. I had a cheese scone, the local butter melting into it luxuriantly. 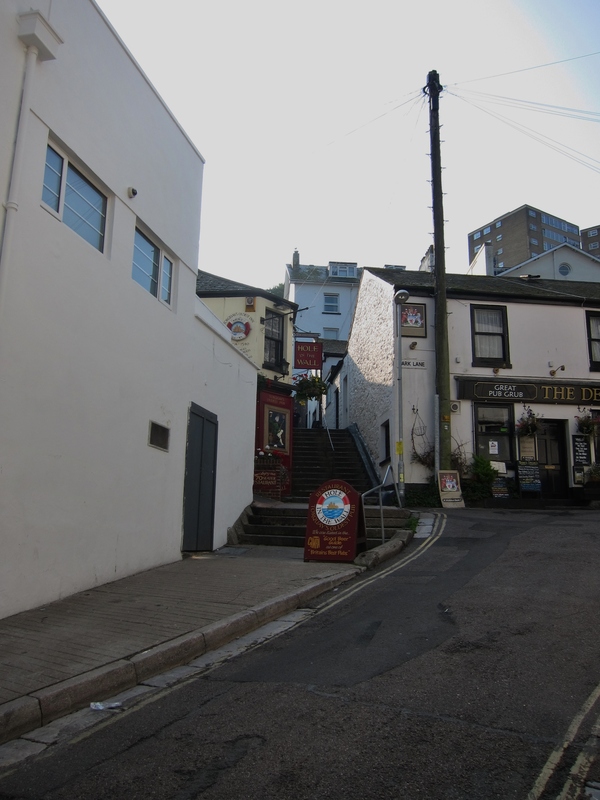 I ate in the Hole in the Wall, reputed to be the oldest pub in Torquay. 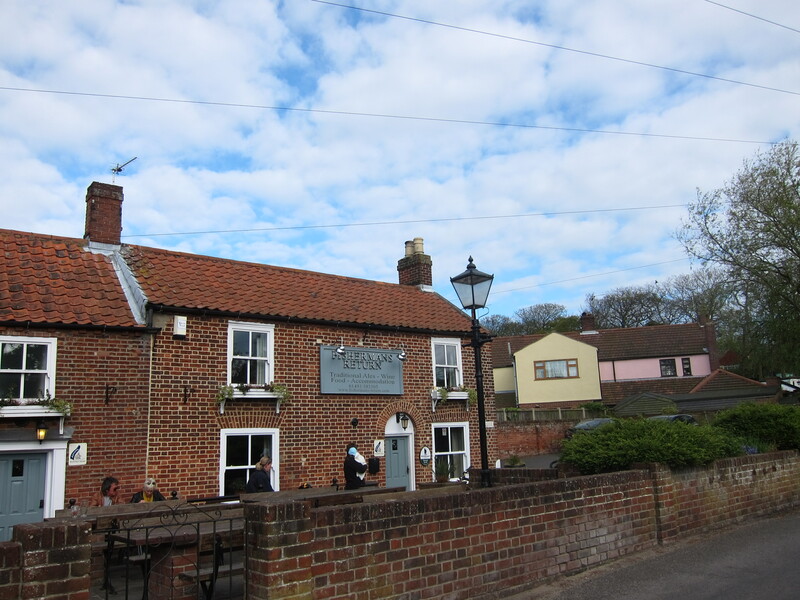 The Grove pub was good value – fresh food and plenty of it. 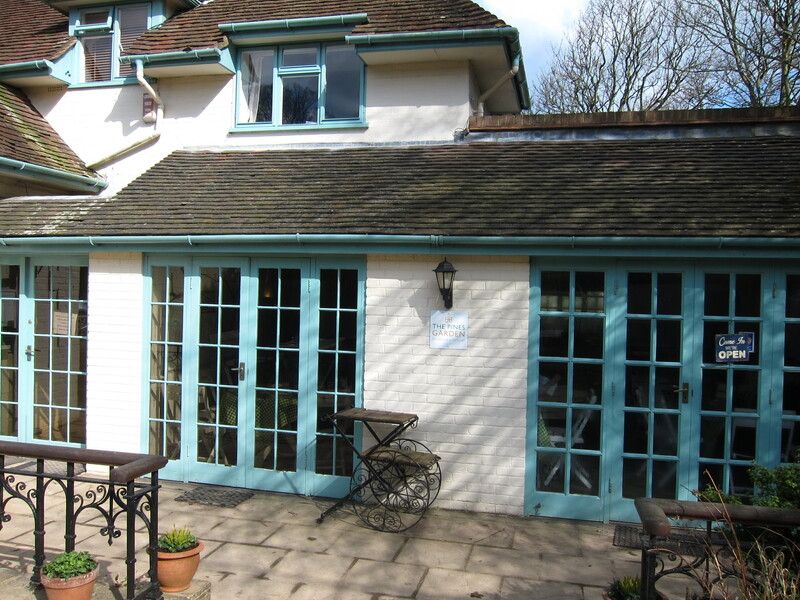 The Blue Waters B & B was a delight – very clean, with breakfast brought to my room, and a pretty courtyard full of flowers. We visited the Bakery in Lyme Regis – the set up is a bit odd – you help yourself to scones, jam and butter (no cream, although the butter was so rich it was bordering on cream) and piled the items onto a wooden chopping board. There were rather a lot of wasps and a very bumptious young herring gull watched our every mouthful. Scones pretty good! The food at the Abbotsbury Swannery was good, but very expensive. 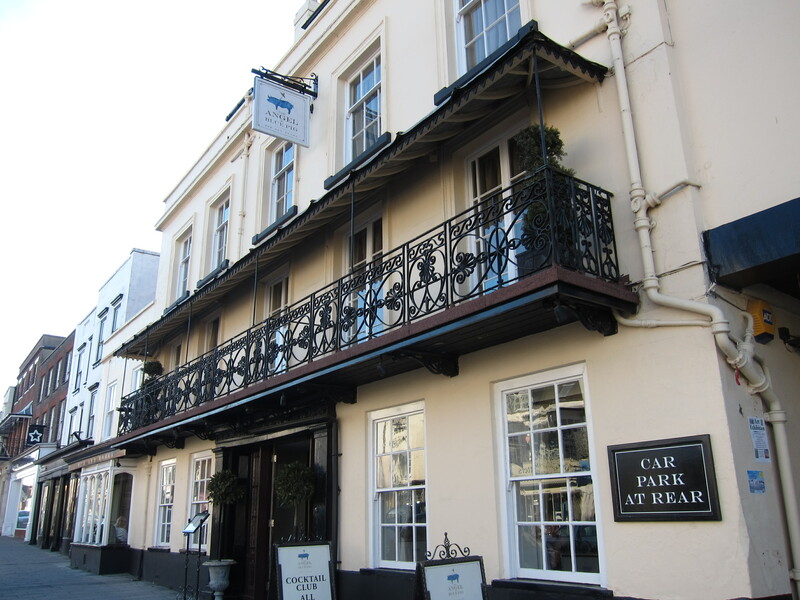 The Bull in the high street of Bridport was pretty good – excellent Venison Burger. Generally rather dull, but a very good Dorset Cream tea in the cafe under the lighthouse. 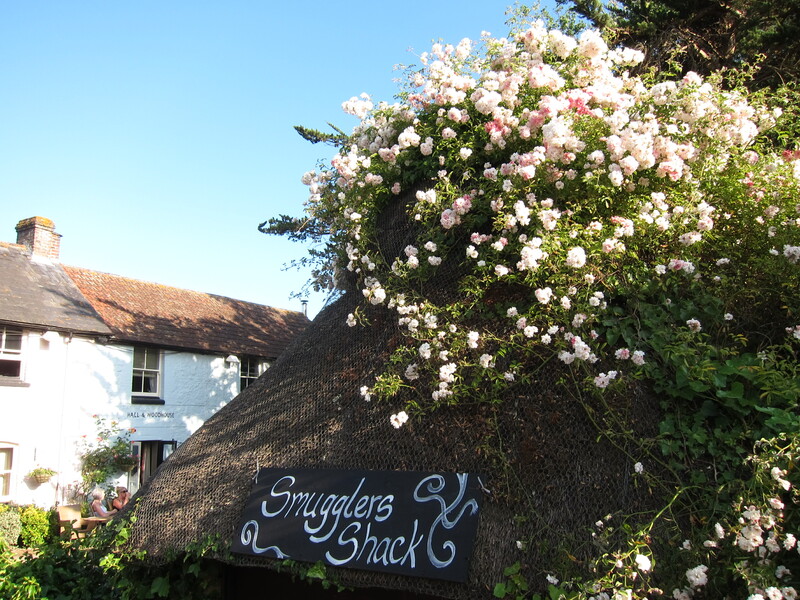 The Smugglers’ Rest at Osmington Mills is well worth a visit – great pub food, friendly staff and a pretty garden. Couldn’t be better. 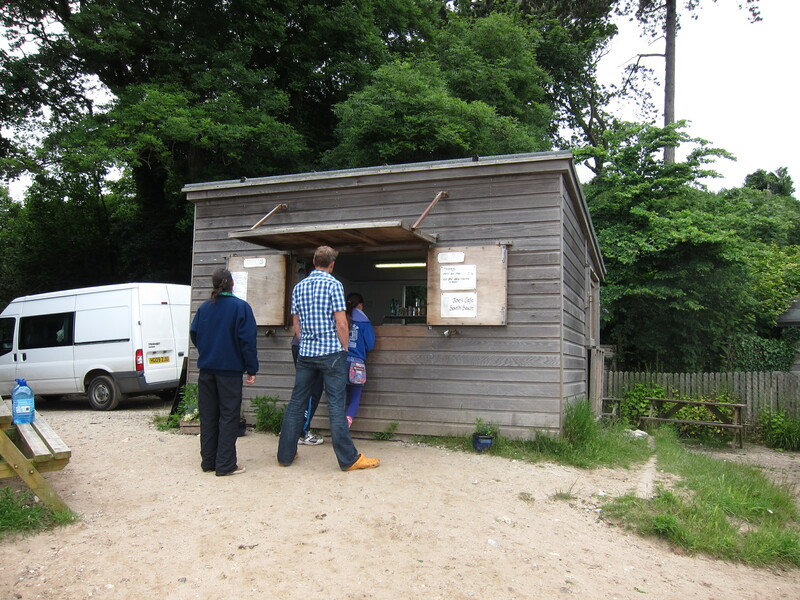 Great little cafe on the beach at Studland – superb home made chocoloate brownies! The Scots Arms in Kingston had a good selection of puddings, and a superb view over Corfe Castle. Dinner at the Bull and Bait in Swanage was excellent, in parts! Food good, but service a bit patchy. Nevertheless, my potted duck, Vicki’s chowder and Liz’s hake were all top-notch. I didn’t stop for a meal on this section, contenting myself with nuts and apple. 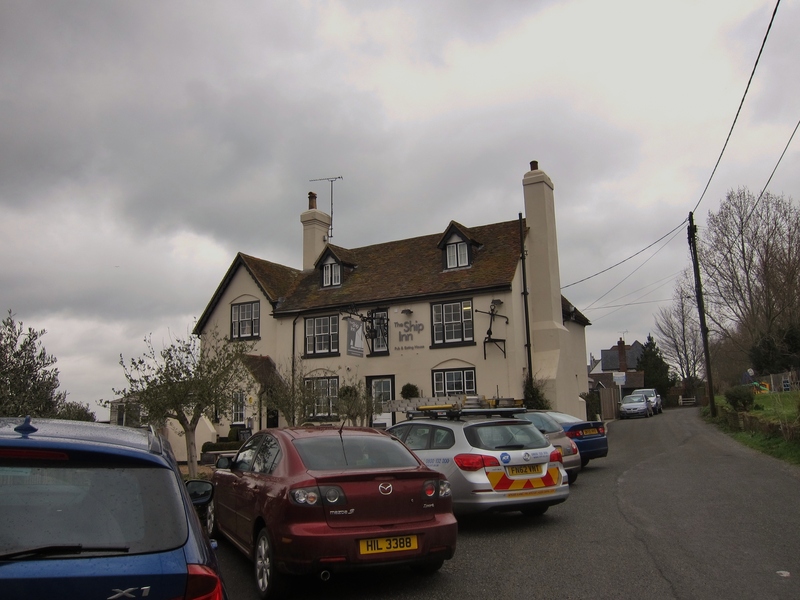 The Angel and Blue Pig, Lymington. 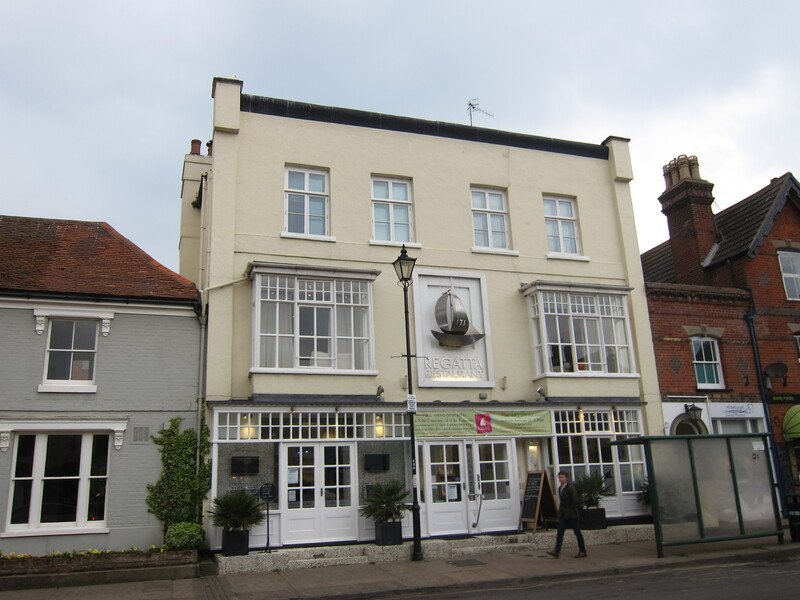 A great traditional coaching inn with oak floors, sash windows and solid furniture, I had a superb starter of duck with cucumber yoghurt sauce, a reasonable roast beef, and an absolutely exquisite home made lemon posset. Service was a bit slow, but they were quite busy. 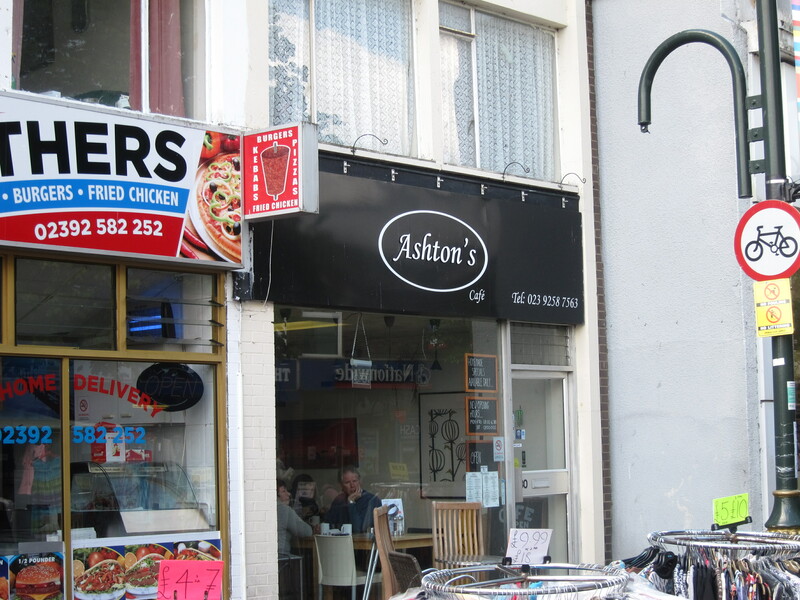 Ashton’s cafe in Gosport did a very nice, freshly cooked breakfast – perfect poached eggs, made in water, not in those horrid cup things. Bonne Bouche is cute a little delicatessen in Hamble, with much pleasanter staff than the other establishments I tried to patronise. I had a first class home-made leek and Stilton quiche, followed by Victoria sponge, sadly with butter icing rather than cream, but very light sponge. A pleasant little tea shop, called Manna, opposite the old Cathedral ruins. The scone was excellent, and the decor was bright and modern. This section was very limted for culinary delights. 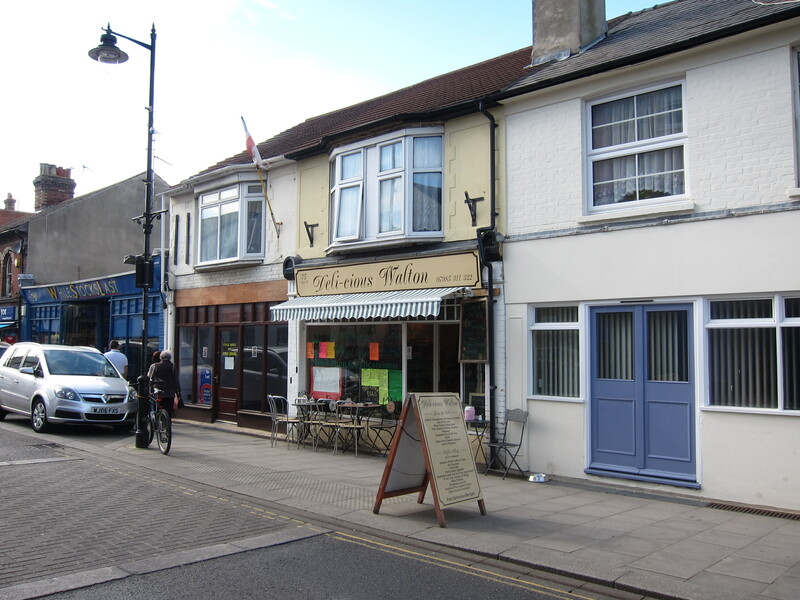 A nice little, local cafe at Littlehampton is the best I can do – Bunnies in the high street serving excellent home made lunches. I had an absolutely enormous baked potato, followed by an even more outsized slice of cake. 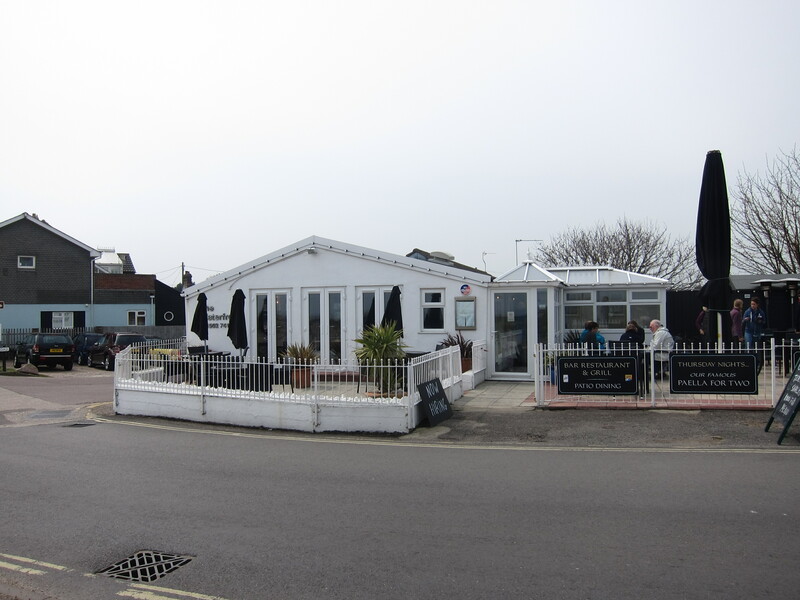 Novecento, a little Italian restaurant just back from the seafront was selected from the best reviews on Trip Advisor. The music was a little loud, and the temperature a little low, but overall we would certainly endorse the plaudits – we managed to eat 4 courses! The beef carpaccio was gorgeous, and the home made ravioli was spectacular. I had fillet of beef, and Bridget the day’s fish special. We then tucked into home made Tiramisu and washed the lot down with a Bardolino. Best of all, we could limp back to the hotel within 5 minutes. 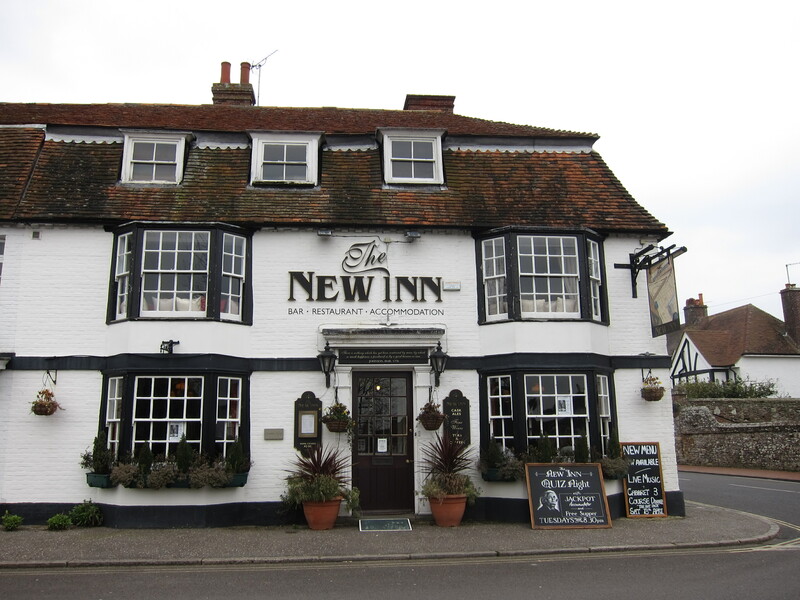 We ate lunch at the New Inn in Winchelsea – a delightful traditional pub with a large open fire. I had Rye Bay scallops on black pudding and chorizo. The scallops were absolutely enormous – at least as big as my palm with the orange bit (the coral?) still attached. Probably the best scallops I have ever had. Bridget had a less exotic, but still tasty, ham and mustard sandwich. Dinner was also very good. 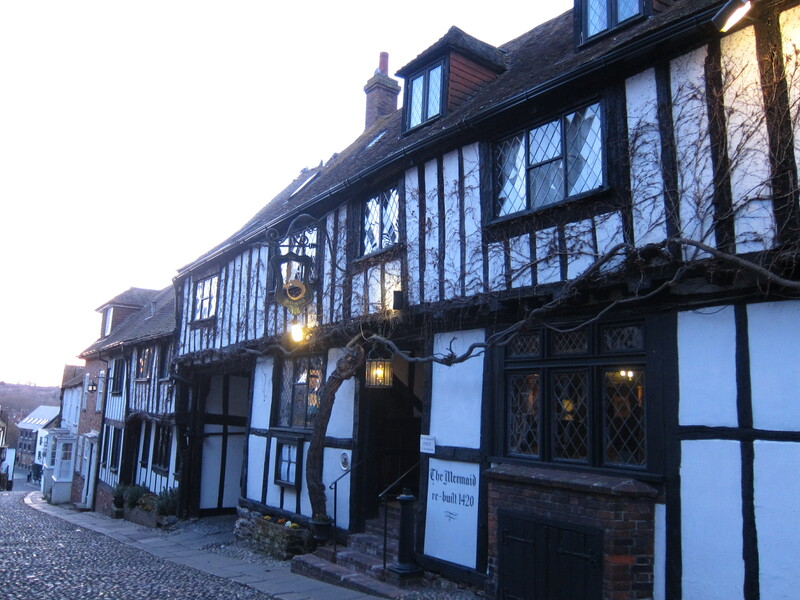 We decided to return to Rye as we had seen a number of places that looked nice, and overall, the town is a great deal more attractive than Hastings. 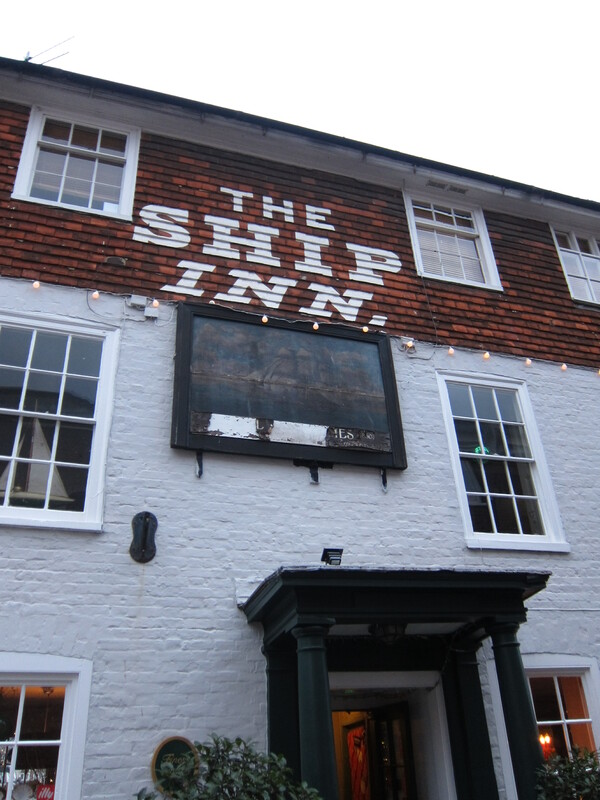 We selected the Ship Inn, which was nicely decorated with tongue and groove panelling and a collection of assorted chairs and tables. Bridget had a very good Cullen Skink, whilst I went for Portabello Mushroom with brie and onion marmalade. We both had “posh fish and chips” which was cod with a coating of parmesan and herbs. Excellent! but the blueberry meringue roulade was a reasonable substitute. At St Margaret’s at Cliffe there is a small museum and tea shop, called the Pines. In honour of Easter I ate a huge hot cross scone (a combination of hot cross bun and fruit scone). Homemade, warm and slathered with butter. The other home made lunches and cakes all looked superb as well. Highly recommend! The Tartar Frigate http://www.tartarfrigate.co.uk/ on the sands at Broadstairs had a very friendly landlord – Eric, and served an excellent cod and chips to Rachel and fish pie to me. 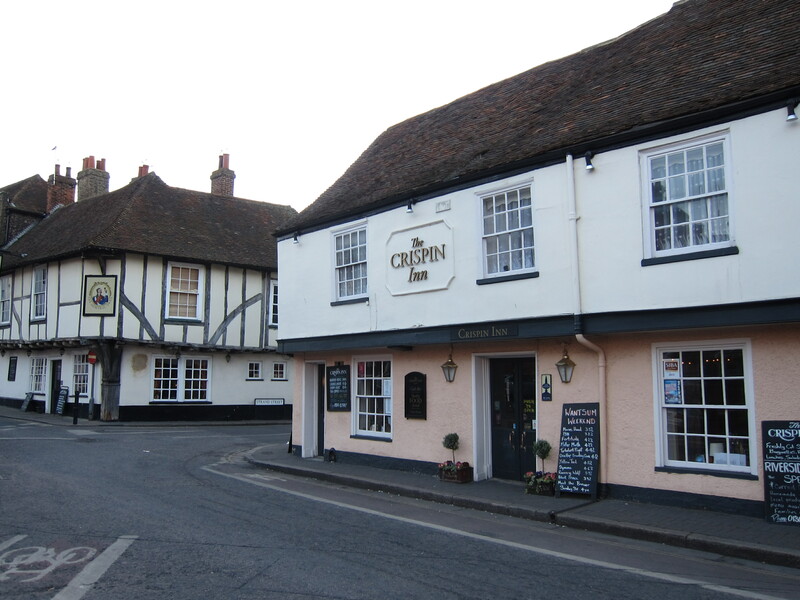 The Crispin Inn is right on the river at Sandwich, built adjoining the tollbridge and overlooking the river, http://www.sandwichpubs.co.uk/ We had an excellent meal of steak pie for Rachel and fajitas for me, followed by really good berry crumble. Mmmm! 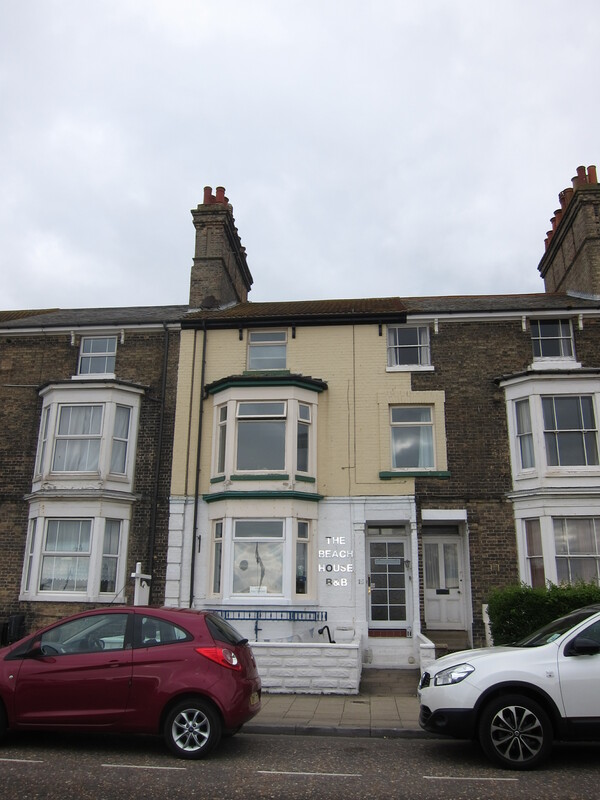 There are not very many places in Margate to eat, that are not of the take-away kebab, kiss-me-quick variety. Eventually we found The Cupcake Café, entirely decorated with Cathy Kidson material and china teapots with Keep Calm and Carry On type posters everywhere – Keep Calm and Eat a Cupcake seemed to be the winner. We both had home-made parsnip and parmesan soup then shared a slice of lemon cake and a slice of chocolate cake – both excellent, but the lemon was slightly out in front. Papa’s Fish and Chip Shop, Northwood Road, Cliftonville is as good a fish and chop shop as I have ever been in. I had the restaurant menu (!) which included salad garnish. The food was beautifully crisp, with no grease anywhere. Another good pub found. The Ship at Convyer. On the river’s edge it looked very unassuming, but inside, it was great. 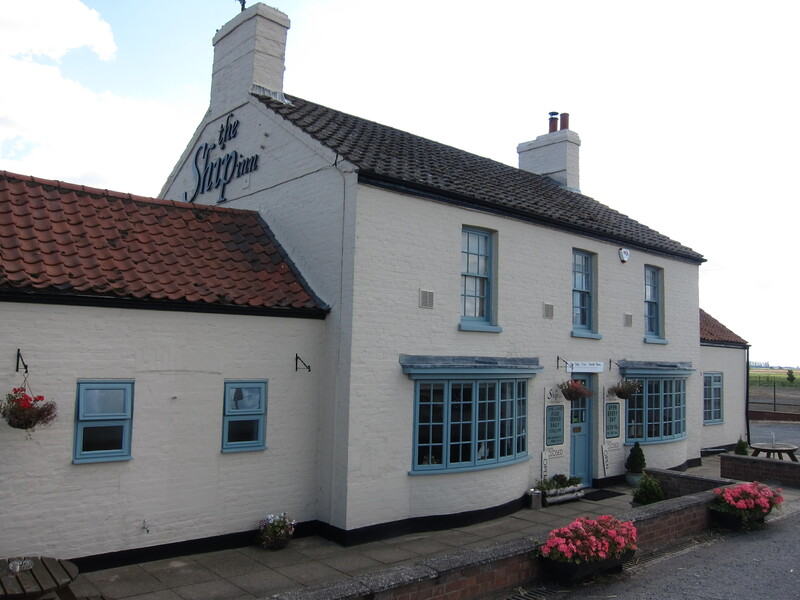 It has been done up in the modern style with slate and oak flooring, but still has proper open fires and a traditional landlady who was running a tight ship, if you will excuse the pun – stern request to leave muddy boots outside! Excellent Sunday lunch of roast topside of beef with home made horseradish and superb puddings for £14.95 each. 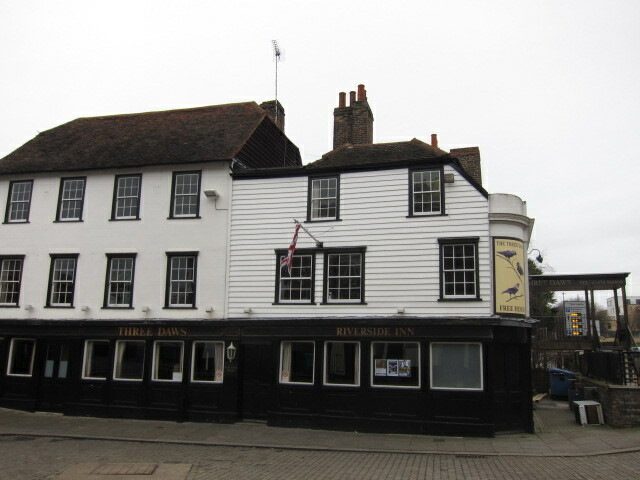 The second place to recommend is the Three Daws Pub in Gravesend – an excellent traditional pub, largely 18th century, overlooking the pier, which is apparently the oldest iron pier in Britain. You can get the ferry from here across to Tilbury docks. A couple of roast dinners and a bottle of red disappeared in record time, as a beautiful, full, yellow moon rose and shone on the water outside the window. 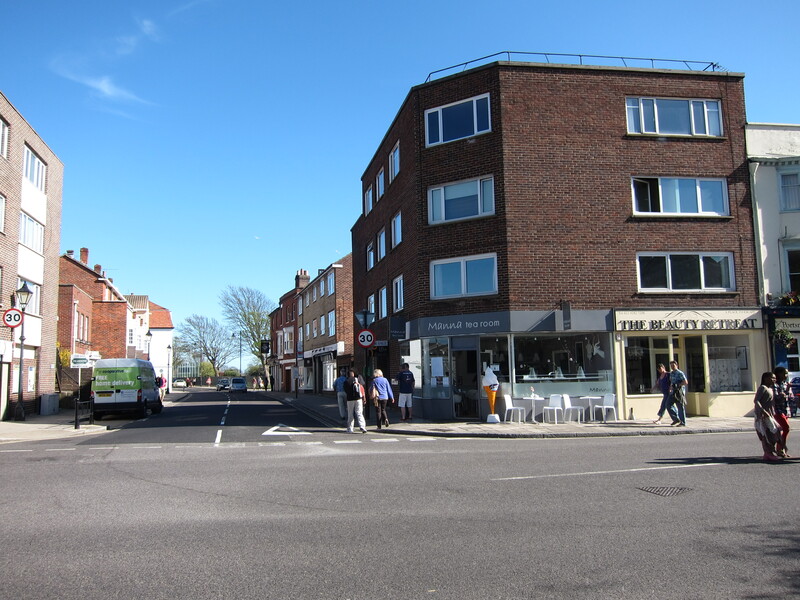 The first eatery worthy of note is the Frizzante Cafe at the City Farm near Rotherhithe. High quality bacon sandwiches were the order of the day, with a “hot toddy”, sadly minus the whisky, to go with them. 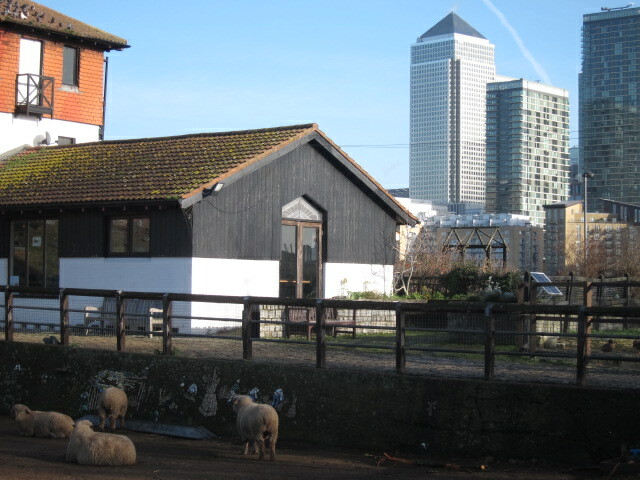 It was strange seeing sheep and goats with a backdrop of Canary Wharf tower! I remember walking from Boston to Spalding on a very hot day and thinking that the pub at Fosdyke Bridge would be open. It was closed and my dog and I were very very thirsty walking into Spalding.